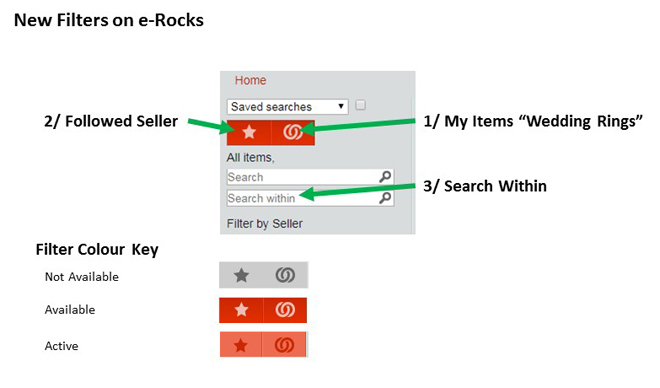 3 interactive filtering tools to assist in selecting/managing items in both Auction Pages and Search Results. Use of the new features is of course optional but you must be logged in to use them! 1/ My Items Filter – the “Wedding Rings” filter. You will see the My Items (Wedding Rings) filter to the top of the left hand column of any Auction, Fixed Price or Search Results page. If you have watched, bid or are outbid on any item, the My Items filter will become active; if selected it will show all items you are actively involved with on that page. You can reverse the process by de-selecting the filter. All My Items are still available via the link in the logged in menu. 2/ Followed Sellers – the “Star” Filter. Similar to the My Items (Wedding Rings), the Followed Seller (Star) filter is set to the top of the left hand column of any Auction, Fixed Price or Search Results page. If you have any items from designated Followed Sellers in the page, the Followed Seller filter will become active and if selected will display items only from your Followed sellers on that page. Again you can reverse the process by de-selecting the filter. Setting up/removing a followed seller is done by clicking/re-clicking the “Followed” button on any item page or in the seller anchor page. We have also created a full (active) seller list and followed seller management option “My Followed Sellers” within the logged in menu. Within the lists there are the same set up/remove controls activated by clicking/re-clicking the “Followed” button. Note: the filters work together and in tandem with other filters on offer, eg if you have My Items and Followed Seller active, you will only see items you are interested in from your followed sellers. This is a new feature also within the filter controls on the left side of any Auction, Fixed Price or Search Results page. In this column you will see an input box into which you can key and submit a search to page on view. For example if you have a mixed auction on view and you want to find items with Calcite, you key “calcite” into the input box and submit, and the new page will show results for that auction containing calcite. If you have a page of Tsumeb search results and you want to find items with Calcite, again you key “calcite” into the input box and submit, and the new page will show results containing calcite. (Note:This works if you are not logged in). 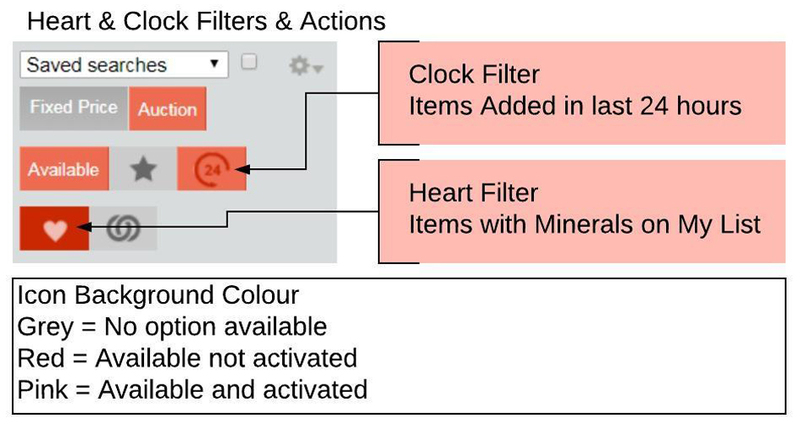 4/ My List Filter – the “Heart” filter. When you have stored any mineral in My List, the Heart filter will guide you to any Items on a content page that contain minerals are on your list. For example if you have saved "Gold" in My List and you look in an auction. If a specimen containing gold is present, the filter will become active. If you select and click submit the page will return with just gold items listed. 5/ Last 24 Hours Filter – the “Clock” filter. Also introduced to work with My List is the Clock filter: this will guide you to any Items on a content page that contain minerals that have been made available in the last 24 hours. This filter will only become active if there are new items on the page, and once activated the page will return only those items added in the last 24 hours. Note: this filter is not displayed on Auction pages - as these pages are started together.